A classic traditional game of skill and accuracy where all the family can compete on equal terms. The Quoits garden game contains 5 hardwood screw in pegs, painted red and green base and 4 real rope quoits. 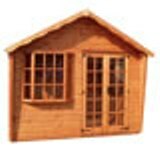 Windsor summerhouse 2.44 x 3.05m with attractive bay window and an optional verandah. 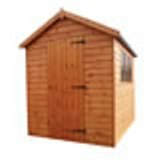 A Hi-eaves traditional style apex shed 366x183cm with various door configuration options. This Vernon pavilion is an elegant octagonal shape perfect for any outdoor space. 11'5"x9'8"
This powerful heater is perfect for almost any size of amateur greenhouse, available with an electric or non-electric thermostat. This 11kW CO2 generator is designed to speed up photosynthesis and in turn a plants development. Aluminium football goal post is suitable for all ages and skill level. Quick setup and ideal for target shooting. The large Handy Trolley is ideal for transporting a wide range of tools and equipment across your yard or garden. Slide Sail Shelter perfect for providing a cool and shaded area within the garden. 9'8" x 16'4"